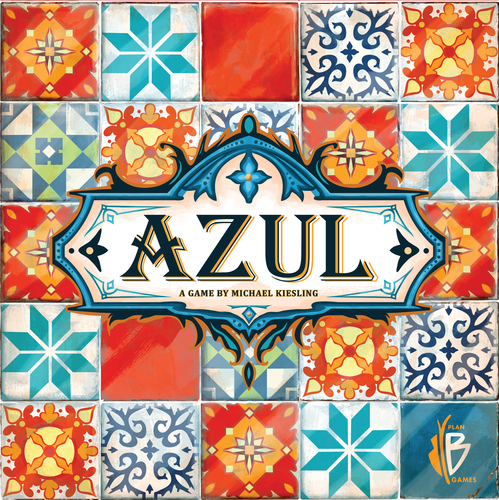 Azul the new Essen 2017 release from Plan B Games. 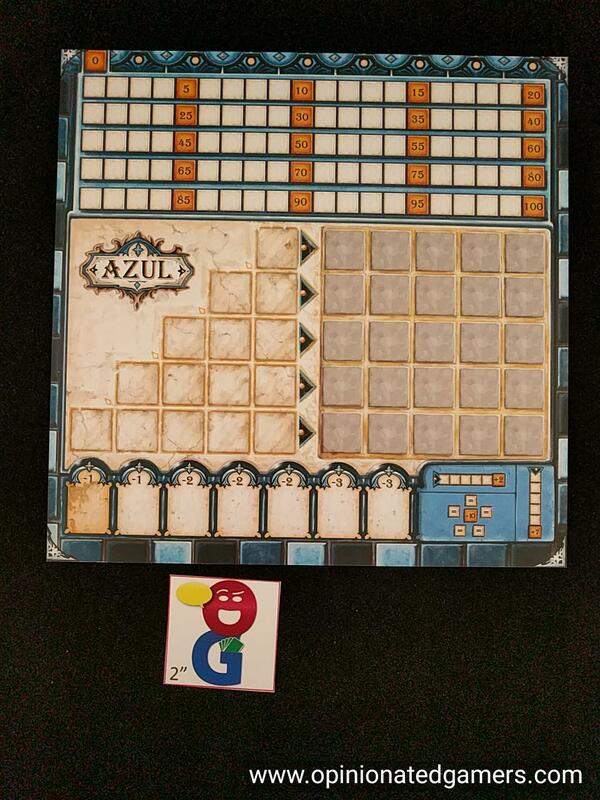 While many at GenCon were excited to see the Golem themed version of Century; Azul was the only game that I had eyes for at the show. I’ve had my copy for just over a week now, and it’s been in constant play. 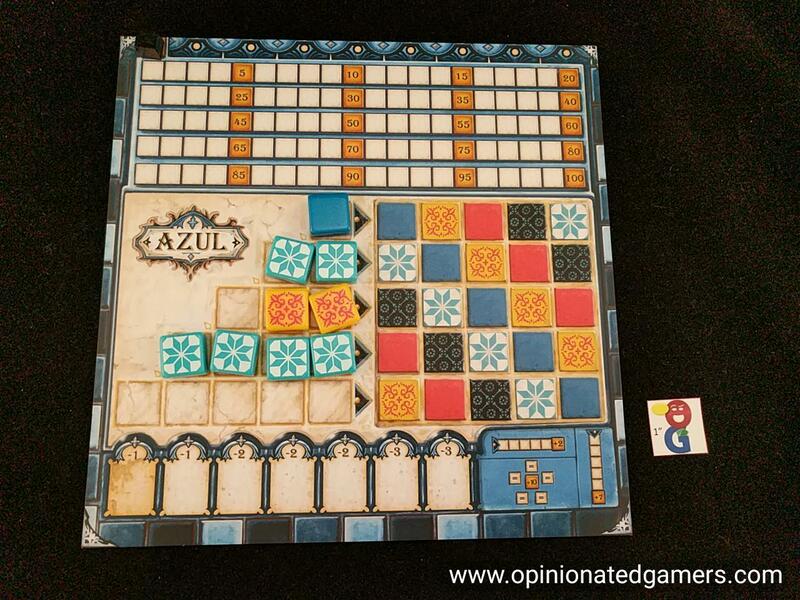 In this game, players try to decorate the palace of King Manuel I of Portugal in a style mimicking that of the Alhambra palace in Spain. The tiles in the game are nice plastic tiles. There are five different designs with 20 copies of each. These tiles are mixed up in the provided bag at the start of the game. Each player gets his own player board which has his personal score track as well as an area to work on his wall designs. There are a number of Factory displays that are placed in a circle on the table (the actual number based on the number of players). A start player is chosen at random, and that player then dips his hand into the bad and randomly draws out 4 tiles for each Factory display on the table. The game will be played over a number of rounds – each following the same three phases: A) Factory Offer, B) Wall-tiling, C) Setup. In the Factory Offer phase, players take turns choosing tiles from the board – with the goal being to try to fill in all the lines on the left side of their player board. This phase will continue until all tiles have been chosen. 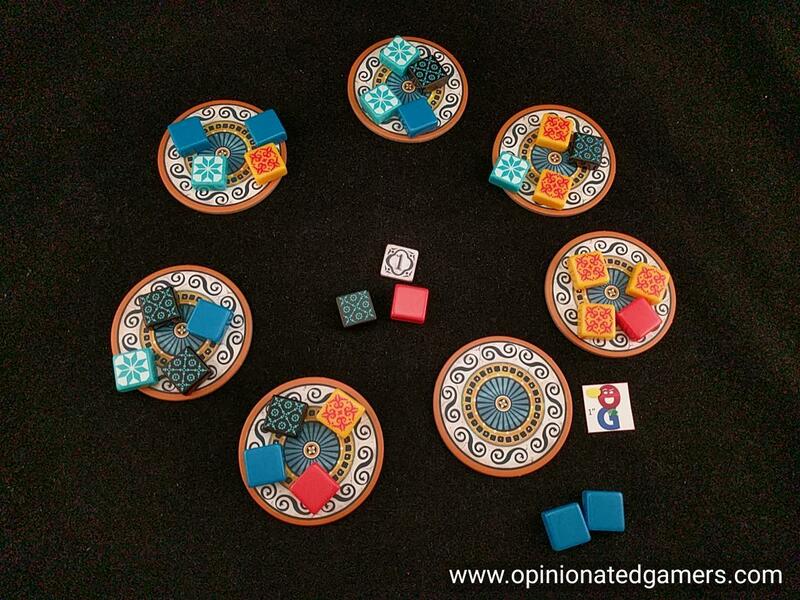 The starting player starts, and places the start player marker into the center of the table. In general, players have two choices. They can choose to take all the tiles of the same color from any one of the Factory displays. All unchosen tiles are then moved into the center of the table. 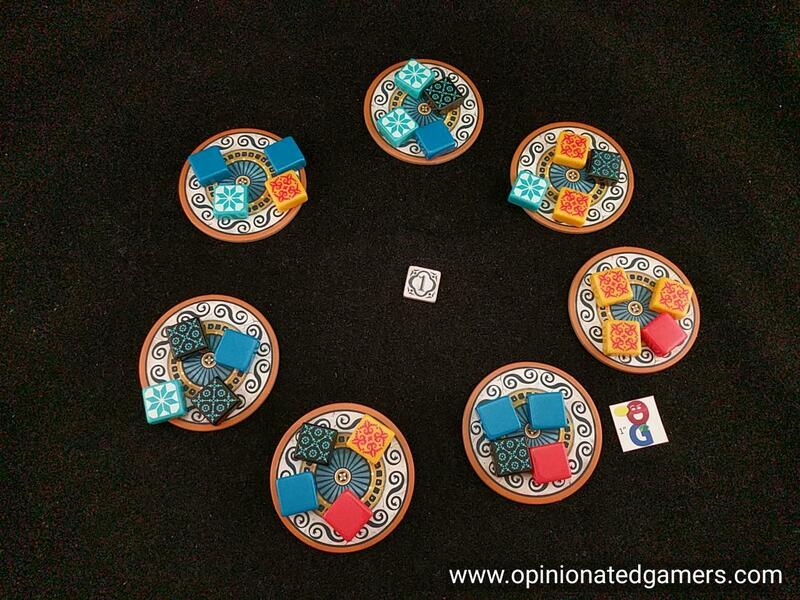 The player can also choose to take tiles from the center of the table – taking all the tiles there of the same color. If he is the first player to do this in a round, he also takes the starting player tile. 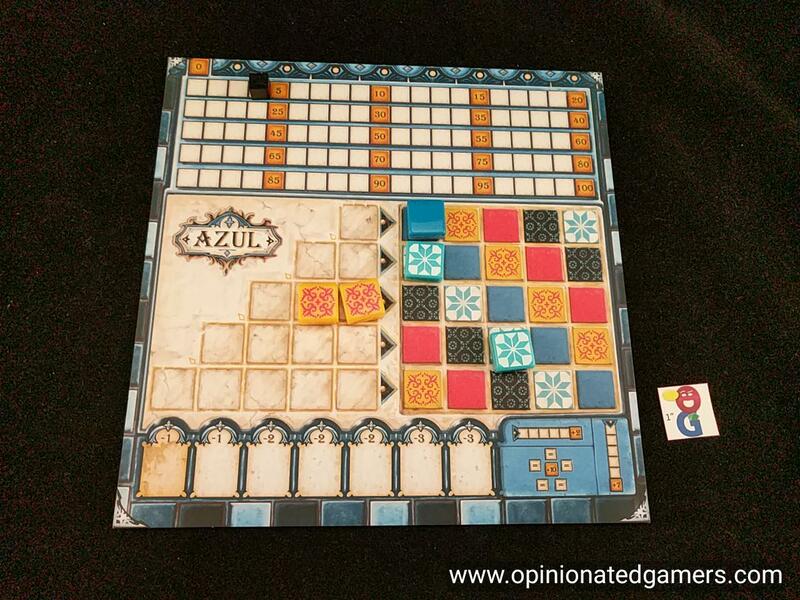 The chosen tiles must now immediately be played on the player board – into the triangle of empty squares on the left of the board OR into the floor row at the very bottom of the player board. If the start player marker token is chosen, it must go into the floor row. The colored tiles must be placed into a SINGLE row; they must be placed from right to left in the chosen line. Once a line has tiles in it, only matching tiles can be placed in that line. Furthermore, if you have already placed tiles into your colored wall on the right, you cannot place tiles in the line IF you already have a matching tile in the colored wall in that same row. If you have more tiles than you can place in empty spaces in that row, you must put the extras into the floor row. In the unlikely event that your floor line is already full, simply discard any tiles that cannot fit in your floor line. Note that you could also choose to put your selected tiles into the floor line. In the wall-tiling phase, players now move over tiles from completed planning lines onto their colored wall. Starting at the top of your plan (i.e. the row with only one space in it), if every space in that row is filled, move the rightmost tile into the matching space on the wall row to the right. Then, score the tile you just placed. If there are no other orthogonally adjacent tiles, you simply score 1 point. If there are other tiles adjacent, first look at the row of the new tile and score 1 point for all contiguously adjacent tiles in this row. Then look at the column on the new tile and score 1 point for all contiguously adjacent tiles in the column. Yes, you will score the placed tile twice… Then, go back to the planning lines on the left and move over the rightmost tile of the next fully completed row and repeat the scoring procedure. Do this until you have finished all completed rows. Before the phase ends, you must also score your floor row. Each occupied space in this row will score NEGATIVE points – the actual negative value for each space is printed on top of the space. You can never drop below zero points though… At this point, you now discard all tiles left on your planning side that do NOT have a tile in the rightmost space. Any rows which were incomplete remain in their partially filled state for the next round. Now check to see if the game is over. If any player has completely filled any of the five rows on his colored wall, the game will move into final scoring. Otherwise, you get ready for the next round. 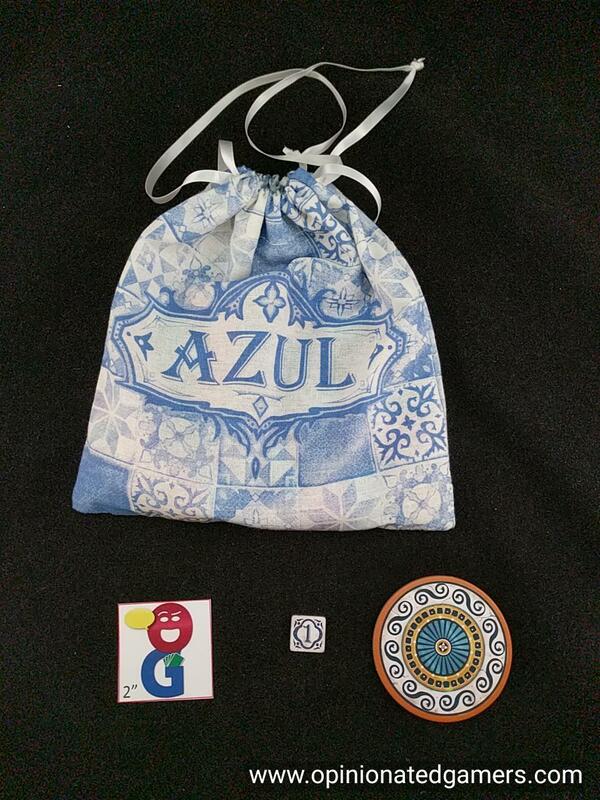 The new starting player takes the bag and places 4 new random tiles on each Factory display tile. If there aren’t enough tiles in the bag, when it is empty, refill it with the discarded tiles from the gamebox. If the game has ended, there is a little bit of endgame scoring – this is nicely summarized in the bottom right of the player board. First, all players score 2VP for each complete horizontal row on their colored wall. Then, score 7VP for each complete column on the colored wall. Finally, score 10VP for each color that you have placed all 5 matching tiles of that color onto your colored wall. The player with the most points wins. Ties go to the player with the most completed horizontal lines on their colored wall. 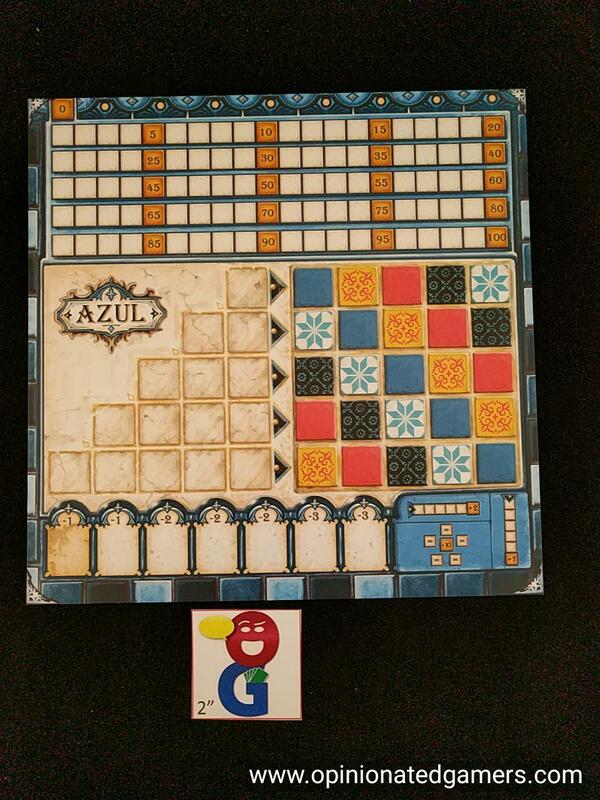 Azul is a fascinating tile drafting game. I find the game to be quite beautiful and visually pleasing, and the strategy of the game play matches the appearance. At the start of the game, I often will settle for combinations that give me large numbers of tiles or sets which finish out a specific row on my board. However, after the first few rounds, you have to start considering the placement of your older tiles as this can lead to huge scoring opportunities. As your colored wall fills in, you also have to consider how the restriction on tile placement on the left comes into play. After a few plays of the game when you’re more familiar with the mechanisms, you may also want to start considering what your left-hand opponent wants to draw because it can be just as valuable to deny him wanted tiles if you have equal options. There is actually a bit of interesting strategy behind deciding to be the first to draw out of the center. You will pick up the start player cardboard chit, and this will give you a -1 VP penalty for sure. Of course, you do get to choose first in the next round, and this is a nice balancing decision from the designer. However, not that the real cost of the tile may actually be as much as -3VP because the tile occupies a space on your floor row. The game feels a little different with 2p as opposed to 4p. In a 2p game, each tile draw has a direct effect on your opponent. It’s a very strategic thing, and you can often play the turns out in your head to see how a round will finish out. I have found it much more difficult to predict how the rounds will turn out with 4 players in the game. Furthermore, there is a bit of binding in the 4p game as your choices do not really affect the choices of anyone except your left-hand opponent. Thus, varying player ability can affect the outcome of the game. So far, all of my games have ended in five or six rounds. The reason for this is that it is generally not a problem for someone to get a tile to fill the top row on their planning board, so it is quite likely for at least one player to move a tile over each round. Be sure to consider this in your planning because the end comes up quick on you! Once you get to round 3, you need to really be looking at how you are going to score points. Getting a 7 or 10 VP bonus for a complete column or finishing out a column can be huge. One thing that I was worried about when I first read the rules was that players would all try to go for the same strategic placement of tiles as each player has an identical pattern on their board. I’m glad to say that placing your initial tiles in the center isn’t necessarily a huge advantage, and in practice, it’s nearly impossible for people to go for the same things at the same time. In any event, the backside of the player board gives you a colored wall that is itself blank – allowing the players to place their tile on any space in the corresponding row. However, you are restricted from repeating a color in a vertical column. I have only played this side once so far, and it was a bit different – but not overly so. I had mistakenly thought that this alternative board was the “expert” side – but after discussing this with the Plan B folks, they claim that it is merely an alternate side, not necessarily more complex than the colored side. The components are excellent. The tiles have a nice heft to them and they are nice to handle. They are smaller than the hex tiles in Hive, but they remind me very much of those; though perhaps the ones in Azul are a bit denser. The individual player boards keep clutter to a minimum, though the one gameplay issue (small) that we have found is that it is harder to easily track scores. Our group has made a habit of simply announcing our scores out loud in each cleanup phase. Realistically, if I need to look at an opponent’s board, it’s only my LHO as I’m trying to specifically deny them a color or leave them a color that they can’t use. Aesthetically, I do wish that all five tile colors had patterns on them. The blue and red tiles are plain while the other three (white, yellow, black) have a pattern on them. Also, it would have been nice for the start player tile to have actually been a tile instead of a cardboard chit. Sure, it functions the same. But, it would have matched all the other bits on your table/board then. The game is super easy to teach. It’s one of those games that you can teach others how to play after only your first game. There are only 2 options in the drafting phase, and the scoring itself is not that complicated. The end game scoring is nicely summarized on the player boards, and that’s all you need to know! 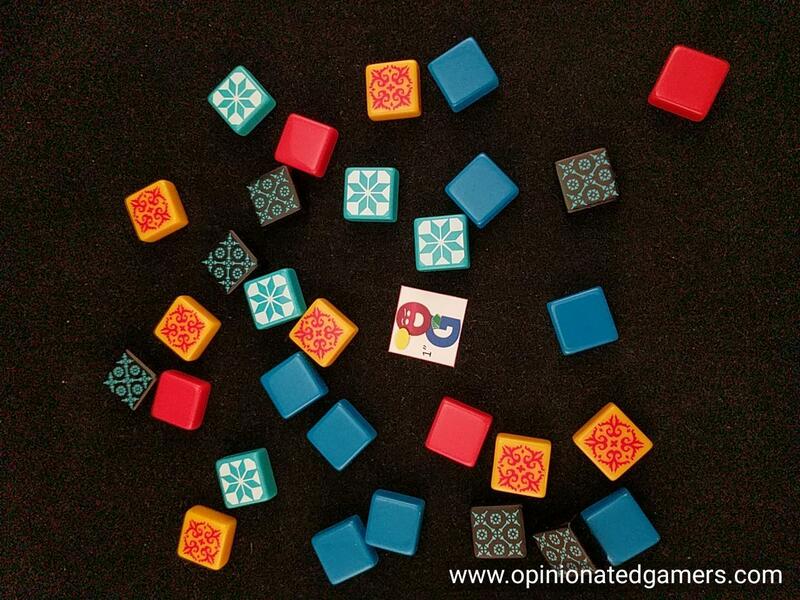 Sure, there is plenty of advanced strategy that could be employed, but at its simplest, you can just look at the table, pick the tiles that seem best for you, and play in your own sandbox after a three minute game explanation. That’s why I think that this game will be a perfect gateway game, and one that I would not be surprised at all to have a Spiel des Jahres nomination/recommendation come next May. There is a certain ease and elegance to the rules, a certain beauty to the components and a surprising depth of gameplay to the game that will tick all the boxes that I think of when thinking about such awards. 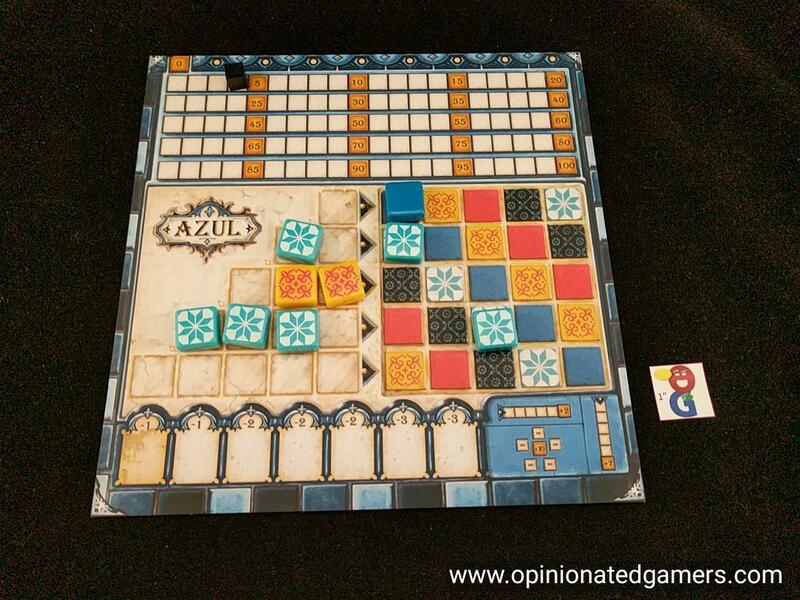 James Nathan: Azul hits a tactics/strategy sweet spot for me; the tiles are outstanding; and I like the streamlined ruleset/microturns. Eric Martin: Ten plays so far on a pre-production copy and a review copy, and I’m still loving it. Beautifully simple, and tense in all the right ways.